The truncated cube is a 3D uniform polyhedron bounded by 8 triangles and 6 octagons. It may be constructed by truncating the cube's vertices at (2-√2) of its edge length. More simply, it may be constructed by radially expanding the cube's edges outwards by 1/√2 of its edge length and taking the convex hull. 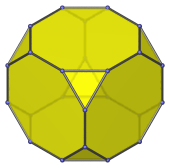 It may also be constructed by radially expanding the triangular faces of the cuboctahedron outwards. 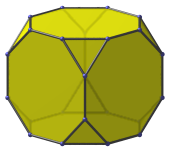 The truncated cube can be augmented with a square cupola (J4) to produce an augmented truncated cube (J66), one of the Johnson solids. Adding a second square cupola on the opposite side produces the biaugmented truncated cube (J67). Parallel projection centered on an octagonal face. Parallel projection centered on a triangular face. Parallel projection centered on an edge shared between two octagons. Cuboctahedron atop Truncated Cube (K4.129). Last updated 23 Jan 2019.